Gas tank connections. Where does it go? Hey, So i was wondering why my tank was leaking with a full tank of gas. ok, so i know the bigger one from the petcock goes to the carbs, then the other small one goes to the first carb correct? yea for some reason gas drips through there i circled when i fill it up fully... its weird. Hopefully I will not need a new tank. Would plugging it up affect flow of gas to the carbs? awesome, i covered up the big one with a little rubber cap/cover. and the small one is run down with a rubber hose. If fuel is coming out the overflow, maybe you don't have a good seal between the gas cap and tank. If you cap it, when it rains or you wash your bike I would think the water might get into the tank. The large one should only leak when your totally full or leaning. Its for when you overfill. 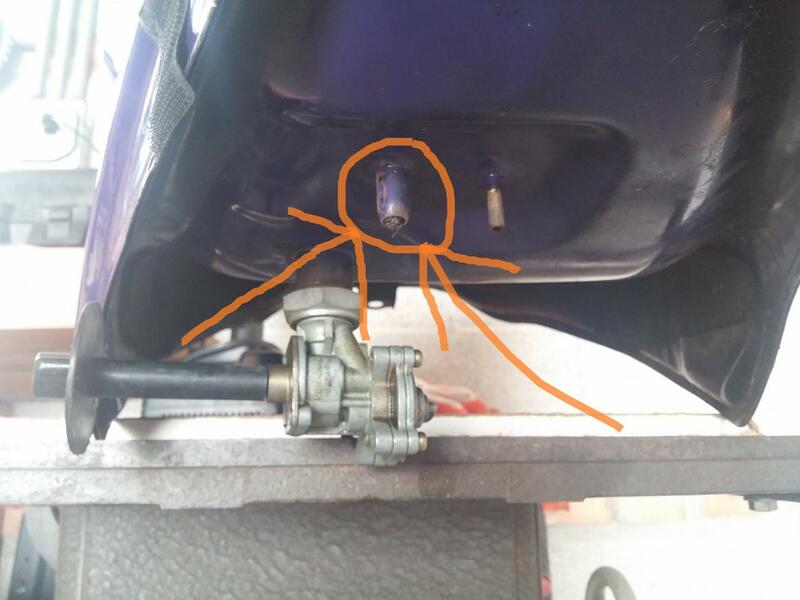 Quick Reply: Gas tank connections. Where does it go?